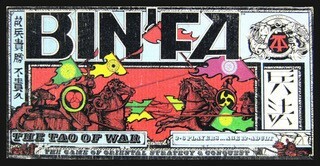 The history of Bin’Fa begins in 1971 when Ken Hodkinson, recently married and with a new baby to support, abandoned his bohemian ways and got a real job as a machine operator at the Waltham Screw Company in Massachusetts. The machine was called a Davenport and consisted of six long metal tubes inside of which steel rods rattled around at high speed. The noise was horrendous, but after a few days, the ears adjusted and it became (barely) possible to hold a conversation. To relieve the tedium of the extremely monotonous work, and at the risk of losing a finger or two, Ken allowed his mind to wander. He wondered what the perfect strategy game would be like. That it should be built around the cavalry charge, that most dashing of military maneuvers, was clear to Ken from the start. Within a couple of years, many of the game’s elements, most particularly the battle sector and the supply sector, were in place: terrain markers consisted of little black sticks that separated one triangle from another, and there were no vortex markers. A maximum of three units could occupy a triangle as there was no stacking of units. This was the state of play in 1977 when Ken published the first Bin’Fa edition as a showcase production of 500 games. He placed it in a dozen stores in Massachusetts and wore out much shoe leather, but without money for advertising, sales were sluggish. All the while, Ken was looking for a publisher to take it over. In September, 1979, he received a letter from the Avalon-Hill Game Company that began, “Congratulations! Our game evaluation people have decided that your Bin’Fa game is suitable for publication in the Avalon-Hill line.” They asked Ken to come up with an alternative name; Ken swallowed his pride and offered Hexagony. And so it was. After its acceptance but before publication, Ken realized that by using stackable checkers pieces, as many as twelve army units could occupy a triangle; the change totally transformed the game. Unfortunately, A-H was loath to incorporate the change and instead relegated it an “optional rules” section. 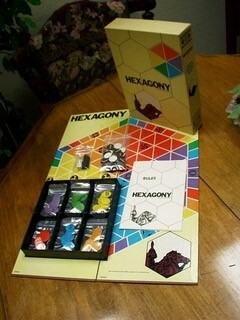 For this and other reasons, Hexagony never caught on, and in 1986, A-H relinquished the copyright. See Board Game Geek. 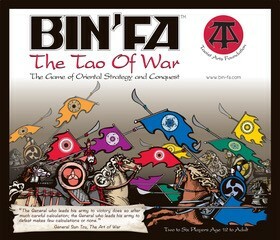 John McCallion reviewed Bin’Fa for Games magazine (now defunct) and made two points. First, players spent too much time chasing after too few supplies; second, successful strategy dictated keeping army units in their home base and accruing supplies while one’s opponent used up supplies moving forward to attack. Both problems were solved by the addition of the “McCallion rule” which states that an army with units on another army’s home base may regard that army’s color as its own and may collect supplies when its supply marker lands on that army’s color. As a consequence, the supply pipeline opened up, and sitting tight at home became a losing strategy. This by just adding one simple rule. Amazingly, the biggest change of all in Bin’Fa didn’t happen until almost forty years from its inception; it led directly to the latest “Central Coast” edition, named after the part of California where Ken now lives. Ken always thought of the Bin’Fa battle sector as a hexagon made up of six large triangles, each comprising 16 smaller triangles. Then, out of the blue, it occurred to him that this was just one of an almost infinite number of configurations. By deconstructing the battle sector and rearranging the six elements in various ways the game was transformed. Instead of a simple hexagon, now there could be lakes and inlets, continents and isthmuses; no two games would ever be played over the same topography again. It is a testament to Ken’s pursuit of perfection that it took four decades to complete his work. Actually, Ken sees it differently: he sees himself as the pursued; Bin’Fa is the pursuer. It is only now that the full magic of the game has been realized that Ken feels released from the game’s grasp. He now intends to devote himself to the Bin’Fa Association and to the Taoist Arts Foundation, to which all profits from the sale of Bin’Fa will go.